Chadron Primary School wants to extend a HUGE thank you to the employees of Creative Dining Services located on the Chadron State College campus!! 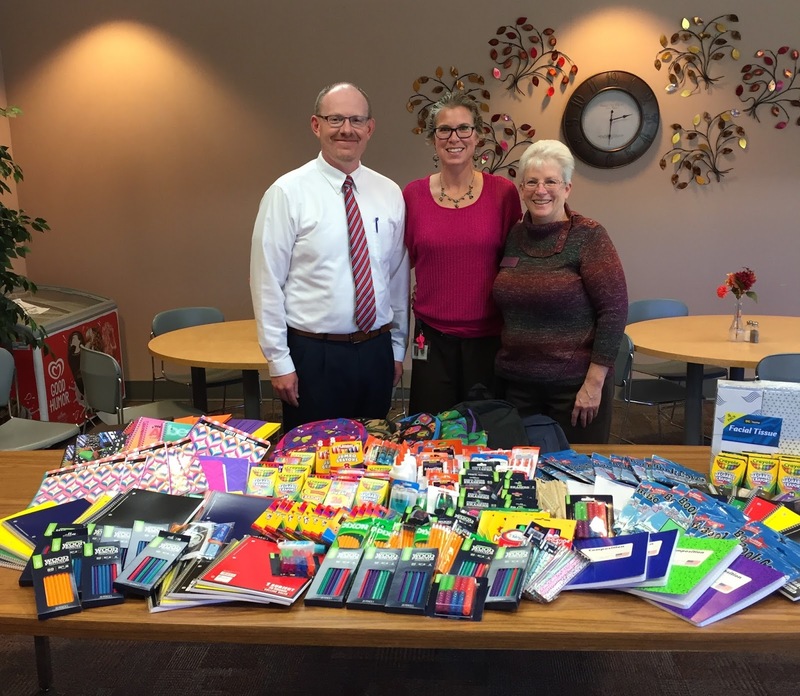 Creative Dining employees collected and donated school supplies to Chadron Primary and recently presented those to Mrs. Uhing. So many of our students will benefit from this AMAZING donation!! Thank you again for your continued support! Mr. Shuck and Mrs. Kuskie of Creative Dining present Mrs. Uhing with the numerous school supplies their employees collected and donated to Chadron Primary School - THANK YOU!! 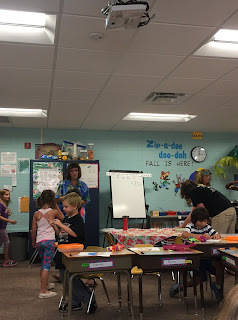 The first grade students in Mrs. Ferguson's class have been working hard on learning the doubles math facts. The children have been rapping their way to learning and are doing so well. It is exciting to see their learning - Keep up the GREAT work!!! Mrs. Claussen-Smith's homeroom students have been working so very hard on following the classroom and Cardinal Rules, this afternoon they celebrated their success with a beach party. Students were even able to make their own banana splits! Thank you to the families that help support positive behavior in our classrooms and school and for the help you offer to make celebrations like this so memorable. Happy Friday!! 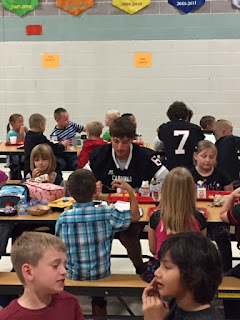 Chadron Primary was lucky to have a few AMAZING student athletes join some of our students for lunch!! 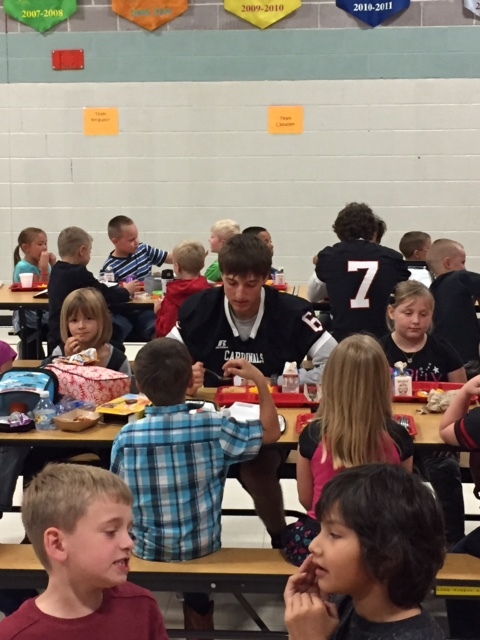 Six students from Chadron High School's Cardinals Committed group came over to our building to eat lunch and visit with our students. First graders and kindergarten students were incredibly excited about meeting and talking with these "Super Stars"!! It was great to see these wonderful role models interact with our younger students and show examples of making good choices. The students were so excited and spent the remainder of the day asking when their "new friends" could come back to visit. A huge shout out to these students and Mr. Mack at CHS for helping to organize this time. We look forward to seeing you soon and good luck in your activities. ROLL BIRDS - big and little!! Mrs. Hendrickson's Language group worked on combining sentences and ended their language time with some journaling. The students really seem to enjoy a time to express their thoughts. Even after the bell rang, many students were still writing away! How exciting to see this love of learning taking place in 2nd grade!! The students were so very excited to see our beloved Ms. Charla!! We are wishing her a continued speedy recovery and cannot wait until she is back with us! 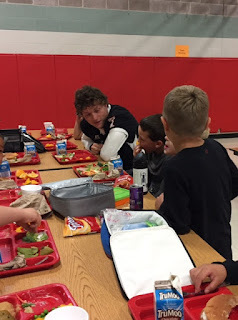 Chadron State College's Elmo Eagle came to visit our lunchroom. Elmo shared the college is hosting a coloring contest and the winners get to ride on the Homecoming float with Elmo!! Students make sure you turn those back in to your classroom teachers by Monday (9/26). 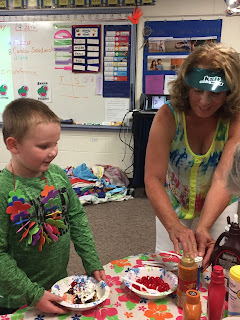 Last week Mrs. Cogdill's class learned about the Primary and Secondary colors. The students used paint with the three Primary colors (red, yellow, and blue) to create their own color wheels. It was such a fun project to watch!! 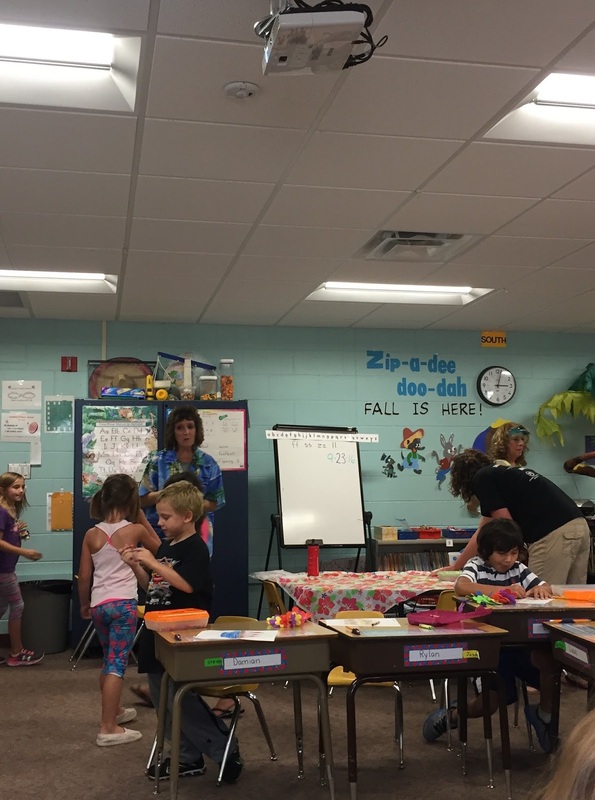 Mrs. Sandstrom's students showed their creative sides as they made fall tree pictures - what a FUN activity! !